I must confess I have hit my limit with technology. While finishing The Circle by Dave Eggers on my Nook, I updated my Facebook fan page linked to important stuff. Then I sent out a Constant Contact newsletter asking people to "like," forward, subscribe to, and read my blog. Next I tried to fix my blog to make it more likable. OK, not easy, but so far I'm getting it. But for me, the final straw is trying to use Twitter and struggling to make all of this technology work together. Like the protagonist of The Circle, Mae Holland, I am becoming more connected, more transparent, and more unglued. "I often wonder if I should have been born in another time...ours is an era of distraction, a punishing drumbeat of constant input...this cacophony which follows us into our homes and into our beds and seeps into our souls...I'm given to wonder if I had just been born when it was a little quieter out there...might I have been more focused and a fully realized person? ...I'd want some of the wonders of modernity, just before everything got amplified." There was no TV and phones had "party lines." Households had one phone and people were tethered to it by a cord. Papers had to be typed and retyped (remember "white out"?). People read newspapers, morning and evening editions, to know what was happening. If you wanted to be a writer, you just wrote on paper. If you wanted to know what your friends were doing, you had to call them. Twitter was a sound made by a bunch of birds. Before you write me off as a grumpy old baby boomer, aren't you impressed that I figured out how to use a computer? Our first one, my son's clunky Apple II-C, came with huge floppy disks and sat proudly in the family room. I cried when this monster ate my master's thesis, and I had not backed up because I didn't know what that was or how to do it. 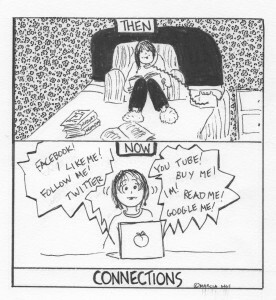 But my relationship with technology did improve. As a preschool director, I mastered (sort of) an increasingly smaller and more complex series of computers, learned a bit of excel, and delved into desktop publishing. I love digital photography and what I can create with the pictures on my Mac. And here I am in retirement, blogging and creating online newsletters. I can even handle Facebook, but Twitter totally escapes me. I have hit my technology wall. Coming full circle (ouch, bad pun! ), in The Circle, Mae is excited to have a job in "customer experience" at an internet company that links all aspects of online experience (TruYou), installs tiny cameras all over the world to monitor everything (SeeChange), and implants chips in children so they can be tracked at all times (ChildTrack). As Mae moves up the ladder, she manages multiple computer screens at once; wears a wrist band that monitors every aspect of her health; becomes "transparent" by wearing a camera and microphone that broadcast everything she sees, says, and thinks; and worries that only 97% of her co-workers think she is "awesome." Mae is warned by a non-tech loving friend that, "
What a perfect book to have read as I struggle to master my encore career as a blogger. Do I really need to connect to all of these things? Is it enough to experience the joy of writing, or do I crave "likes" as much as Mae did? Does it matter how many "subscribers" I have or how many "opens" I get for a newsletter? Will the "punishing drumbeat of constant input" seep into my soul too? So I ask, is it okay to remain a Twitter illiterate? What you do think? A version of this post appeared in ChicagoNow on November 29, 2013. Why? The post 50 actress-turned-activist puts some entertaining spins on world events. She retweets interesting material from journalists and fellow activists alike. She also tweets interesting links to articles in The Guardian, particularly those pertaining to injustices against women and children.